This 1 meter, Ku/C-Band antenna is a beautiful, if somewhat complex, piece of engineering, providing almost total, worldwide coverage (excluding polar regions), combining KVH mini-VSAT Ku-band regional network with global beam, C-band into one seamless worldwide network. The antenna automatically switches to the best available band and beam automatically, and transparent to the user. While multi-regional Ku-band, from several major providers, already covers most of the populated and frequented parts of the globe, KVH have taken this one step further to include global C-Band beams that fill in the vacant areas in the more remote regions of the world. If you cannot be without contiguous VSAT coverage, (even for a week or two) on your global voyage through the remote regions of the South Pacific and South Atlantic, then this is the service for you. But it does come with quite a hefty price tag and is easily the most expensive 1 meter maritime stabilized antenna. Of course, next year there will be Inmarsat's Ka-band Global Xpress that will also offer seamless global coverage at expected competing prices, but this has yet to be seen. KVH makes beautiful equipment, and a thoroughly well proven product and offering. The only disadvantage of this system is that it only works on the KVH mini-VSAT network, so once you own the equipment you are locked into the same provider for the life of the antenna, even as the technology and market changes. However, if KVH continues to evolve with the technology and is able to remain competative and effective, being committed to KVH as a service provider may not be a bad thing. It is an excellant company. 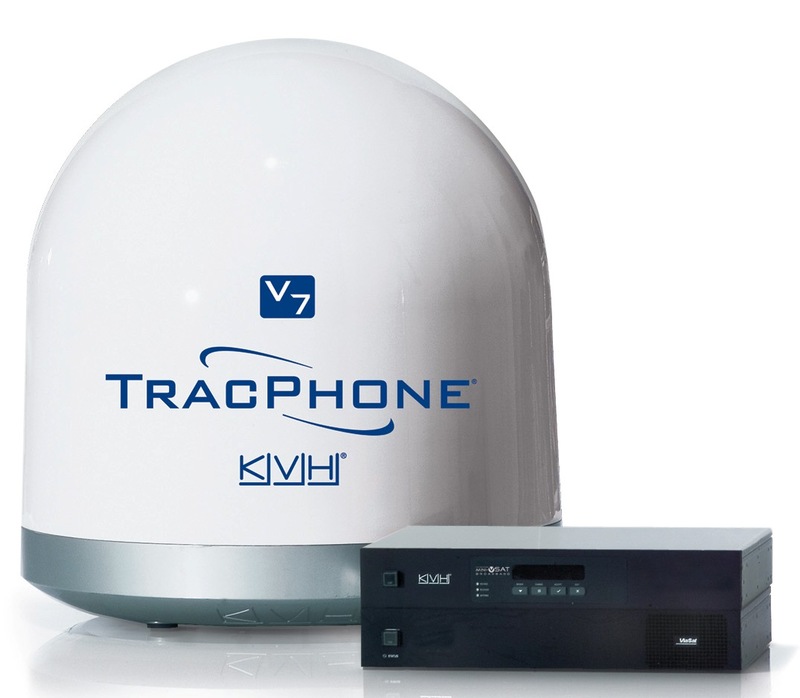 The KVH Tracphone V7 mini-VSAT uses a 24" (60cm) dish and is reported to be capable of download speeds of 2 Mbps and uploads of 512Kbps. Using traditional technology, a 1 meter dish is the smallest one can use without interfering with adjacent satellites. The smaller the dish, the greater the beam width, so the high power signals needed to complete the link from such a small dish, would splash over and interfere with satellites positioned just 2 degrees away from the target satellite. To overcome this problem, KVH uses a modem from Viasat called ArcLight that uses a special form of Code Division Multiple Access (CDMA) and spread spectrum technology, that spreads the signal over several frequencies, thus requiring much less power density at any given frequency, and therefore insignificant interference to the adjacent satellites. Most antennas of less than one meter utilize some sort of spread spectrum technology for this reason. This technology allows for small antennas with less sophisticated stabilization, and therefore greatly reduced weight and cost, to be compliant with the strict satellite operation requirements. 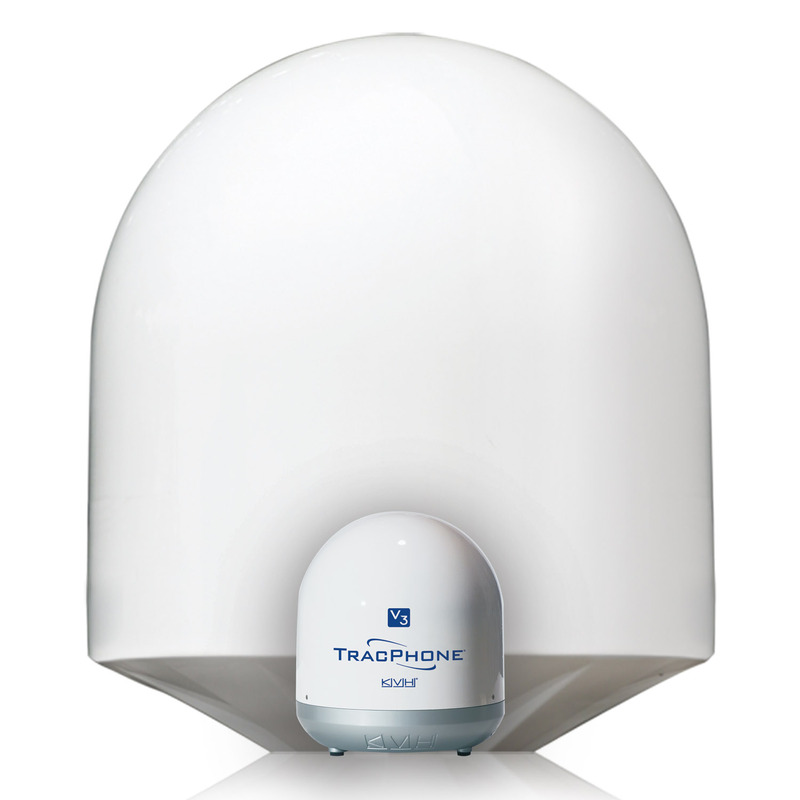 The Tracphone V7 antenna weighs only 60 pounds and is 26 inches in diameter; a solution that can easily fit on some of the smaller cruising yachts that have a need for full time internet access. The Viasat ArcLight modem actually goes one step further and uses, what they call Paired Carrier Multiple Access or PCMA. This allows the return channels in the ship to shore direction to share the same channel as the outbound signal. The KVH Tracphone V7 uses the SES Americom network of Ku-Band satellites giving continental spot beam coverage to North America and Europe and other areas of the world. Small things still come in expensive packages, and the V7 terminal is up in the $33K price range. Subscription plans vary with bandwidth requirements and can be billed by the megabyte (about $5/MB)or on a monthly subscription plans that can reduce this cost depending on your usage. See the KVH website Airtime Ratesheet for details. There are also several pricing options for Voice over IP (VoIP) phone lines. The antenna weighs just 25 lbs (11Kg) is 37cm in diameter, with data speeds of 2Mbps down and 128kbps up, for as little as $0.99c per megabyte, and $0.49 per minute for phone calls. See the KVH V3 Rate sheet. The terminal will retail for about $ 14 500 which is half the price of it's bigger brother the Tracphone V7. The system uses the same Viasat ArcLight Spread Spectrum modem on the SES mini-VSAT network that includes, almost global, multi regional coverage. The simple monthly data plans run from an affordable $49/month including 50MB of data to $999 for 1000MB of data which is a fraction of the cost of Inmarsat calls. The TracPhone V3 includes a fully stabilized antenna, a powerful ViaSat ArcLight® spread spectrum modem, and a sleek below-decks antenna control unit that are all fully integrated and configured for easy installation. The antenna used the same below deck modules as the Tracphone V7. The requirement for 110V/220V AC power might be a bit of a challenge for smaller sailing vessels without generators, having to invert the power from their batteries to power the terminal. This iwould be slightly less efficient than if the terminal was powered directly by 12 or 24V VDC, like the fleet broadband terminals. The ArcLight spread spectrum technology enables very small antennas like KVH’s 24" (60 cm) TracPhone V7 and now, the TracPhone V3 to receive satellite transmissions with the speed and reliability of older, 1-meter VSAT antennas that use TDMA transmission schemes. KVH’s high-efficiency RingFire™ antenna design and dielectric feed rod technology mean the TracPhone V3 offers great performance, even in poor weather, and its rugged design is perfect for use on tuna towers and commercial vessels. 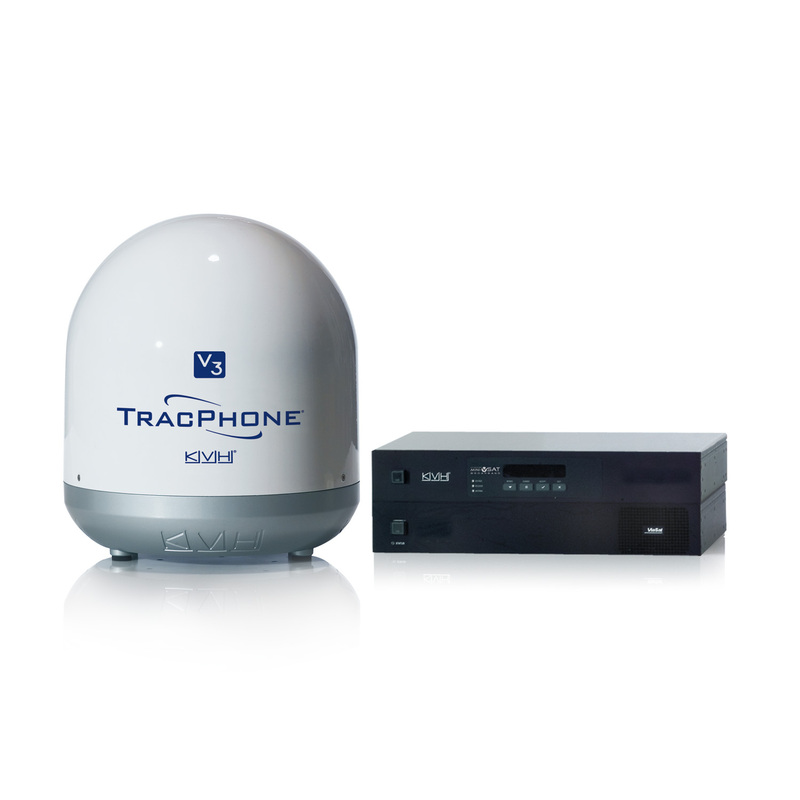 The TracPhone V3 joins KVH’s highly successful TracPhone V7 in KVH’s mini-VSAT Broadband product line. The award-winning TracPhone V7 is ideal for heavy data users who want fixed-price, speed-based airtime plans like those typically offered with VSAT systems. For mariners who don’t need an enterprise-level SATCOM solution, the TracPhone V3 provides the metered rate plans and compact design typical of L-band services like Inmarsat with the faster data speeds and low cost of mini-VSAT Broadband. Already the fastest growing maritime VSAT solution, mini-VSAT Broadband’s seamless worldwide network is delivered by 13 satellite transponders and 10 secure earth stations and offers significant cost savings compared to competing services. In 2010, KVH delivered more than 60 terabytes of data and handled more than 1.5 million voice calls to and from vessels around the globe via the mini-VSAT Broadband network. The TracPhone V7 is the world’s best selling maritime VSAT system, offering a total end-to-end solution for commercial vessels with onboard networks. 30915 visits to this page since 28 Nov 2012.